It’s fair to say that Uganda has had a troubled past, but the country which is described as the ‘Pearl of Africa’ is embracing tourism to its advantage. Uganda is developing the infrastructure of their beautiful national parks and travellers now recognise them as places to visit and experience the vast amount of wildlife on offer. The Queen Elizabeth National Park located in the South of the Rwenzori Mountains, was formed in 1952, the same year as Elizabeth II’s accession to the throne. It is home to some of the most diverse wildlife in eastern Africa, and has over 95 mammal species combined with around 612 varieties of bird. One of the main tourist attractions of the park is to visit the Queen’s Pavilion built in 1954 and subsequently improved upon every time the Queen or the Duke of Edinburgh have visited the country, most recently in 2007. There is also the opportunity to have your photo taken on Uganda’s equator, which runs right through the park. The Queen Elizabeth National Park has always been popular with tourists, and the number of African safari holidays here is now on the increase. The smallest national park in the country is Mgahinga Gorilla National Park. It is a mere 38 square kilometres. Although tiny, it is a significant area as it is one of two parks that are habitats for the endangered mountain gorillas. In Uganda, you can also go on a gorilla safari in the Bwindi Impenetrable Forest. Located in the south western part of Uganda, as the name suggests, it is a tough nut to crack – but it is world renowned for trekking and gorilla safaris. In fact you need a permit ($500 per day) to trek with the gorillas, and these can be snapped up by travellers fast. 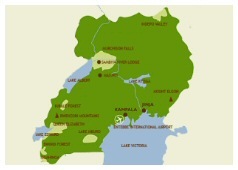 Another of Uganda’s budding parks is Kibale Forest. Described as one of the most attractive national parks in the country, southern Kibale connects to Queen Elizabeth National Park, forming a linked corridor of around 180km for wildlife to prosper. Kibale also boasts a tropical rainforest and is a great destination for chimpanzee tracking. It is not known in Uganda for its African safari holidays, but more and more travellers are combining the best aspects of both – the huge number of bird species in the Queen Elizabeth, and the thirteen species of primate coupled with chimpanzees in Kibale Forest. One of Uganda’s most unique wildlife habitats has to be Mount Elgon National Park. Mount Elgon is an extinct volcano with the biggest surface field in the world (50km by 80km). The caldera itself is 8km in diameter and activities here predominantly include trekking around Mount Elgon, with the Sasa, Piswa and Sipi trials the most demanding. Mount Elgon also hosts the Sipi Falls, a series of four waterfalls culminating in a 99 metre drop that travellers discover at the end of their somewhat arduous trek!